New? No. Rekindled? Yes. 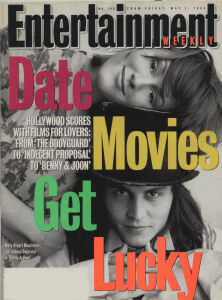 After a decade dominated by action films, the sleeper success of Benny & Joon—an oddball romance starring Masterson and Depp as seemingly ill matched lovers who find each other a perfect fit—is the latest evidence that movies made for couples are finding their niche once again. In its first weeks, the film has launched a flurry of hand–holding in the dark, despite its commercially improbable story: Masterson plays Joon, a schizophrenic cared for by her big brother, Benny (Aidan Quinn). Enter Depp’s Sam, a dyslexic charmer obsessed with silent comedies. Boy meets girl. Boy loses girl. Boy visits girl in institution and wins her back. Even so, the film was nearly derailed before shooting began. Originally Laura Dern and Woody Harrelson were attached to the project. But then Dern passed and Harrelson, who had committed to play Benny, jumped into Paramount’s Indecent Proposal. Furious, MFM slapped Harrelson and Paramount with a lawsuit (since it settled out of court), and the movies fate hung by a thread. Like many of his roles, Depp’s Sam is a misunderstood antihero, a type he gravitates toward because “somebody who is different, who is judged on appearance instead of heart, who is looked upon as a freak—well, all I can say is, freaks are my heroes.” Nonetheless, “after playing Sam, I figure we’ve pretty much covered the innocent-lonely-guy sort of thing. I’m trying to go elsewhere.” That he may do in Tim Burton’s Ed Wood, a black comedy in which Depp is set to play the ‘50s transvestite filmmaker Edward D. Wood Jr. (Plan 9 From Outer Space), who is considered the worst director in movie history. In the film, due for production at Disney this summer, Depp gets to pet pink angora sweaters and dress up in women’s clothing. He can hardly wait. Masterson, whose roles in Some Kind of Wonderful and Fried Green Tomatoes gave her ample experience with eccentric characters (“I get a lot of ‘I’m a misfit too!’ fan letters”), had to walk a finer line when playing Joon.